It’s one of the most popular mobiles of all time, remembered for its near-indestructible build, long-lasting battery and legendary Snake game, and the team licensing the Nokia mobile name has jumped at the chance to reignite the love for a phone which was once the leader in the mobile market. Enter the new Nokia 3310 2017, a homage to the iconic handset with a helping of modern-day upgrades. If you were a fan of the 3310 and long for those simpler times, the likelihood is you’ll want to pick this up. If you’re less familiar with the original though, this is just another feature phone which won’t satisfy your smartphone sensibilities with a price that’s steeper than it needs to be. The original phone sold 126 million units, so while this will never reach that kind of level of sales it may suit those who want to use a feature phone or have a cheaper alternative phone to take to festivals or as a backup in their bag while away. Since this is a ‘revamped’ Nokia 3310, it borrows plenty of design cues from the original. That’s partially true for the front, which has a similar white band around the screen, though the screen itself is now full-colour and much larger. The body is also curvier than that of the original. But the Nokia 3310 (2017) isn’t trying too hard to recreate the past – the buttons look and feel different, and there are more modern navigation keys. On the back, you’ll see a brand new camera with an LED flash sitting prominently above the Nokia logo, and there’s a 3.5mm socket on the bottom. 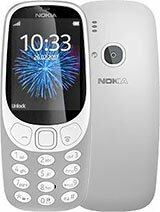 It’s been clear from the start that HMD Global is selling the Nokia 3310 (2017) largely for the sake of nostalgia. There are a few things that do bring back the feeling of owning an original Nokia 3310, such as the classic Nokia ringtone, the physical buttons, the tiny body, and solid build quality. That might be enough for Nokia fans to grab this phone, and sure enough, it has already sold out just as fast as the Galaxy S8 in the UK. The question is whether they’re buying this phone to use it, or just as a novelty or collectible.